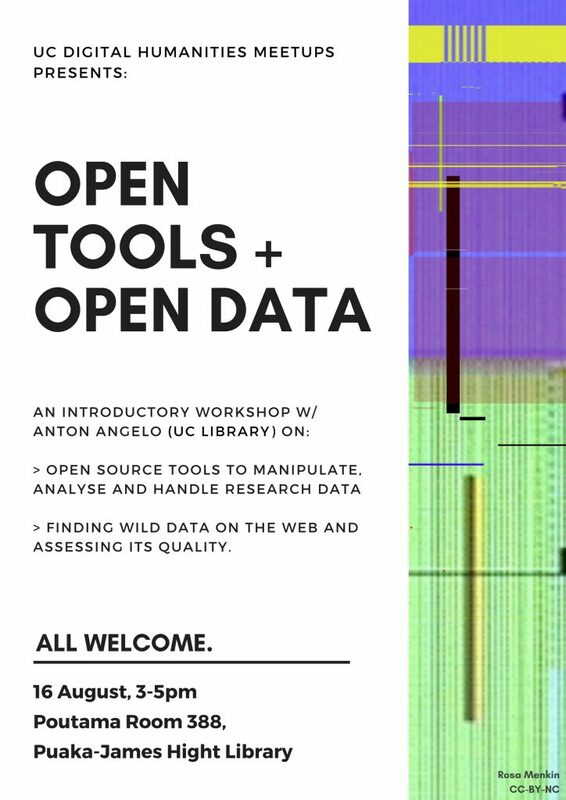 Join us for a DH Meetup run in collaboration with UC Library on the fundamentals of using open data and open tools for research. This session will be led by Anton Angelo, UC Library’s Research Data Coordinator. Light refreshments provided. All welcome. 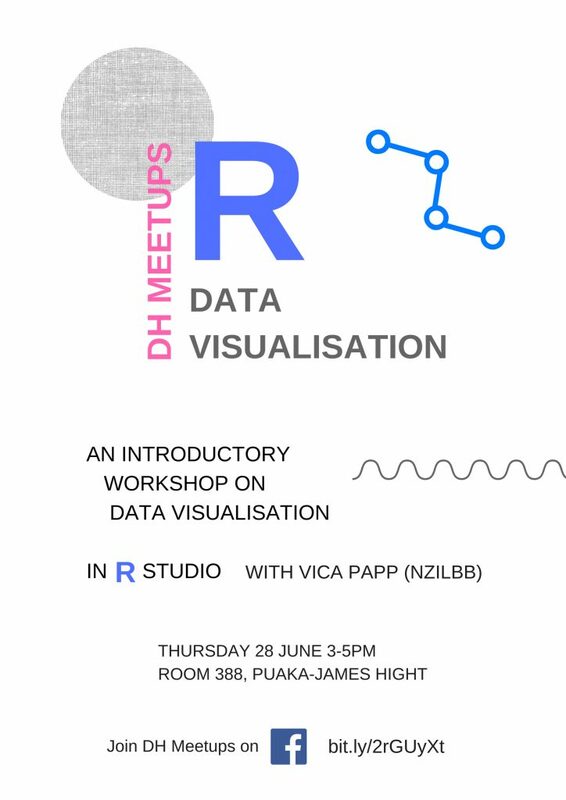 Join us for an introductory workshop on data visualisation in R Studio, with Vica Papp (NZILBB). All welcome. 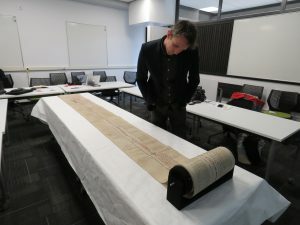 As well as the discussions and presentations, the symposium gave us an opportunity to examine the Roll in person. 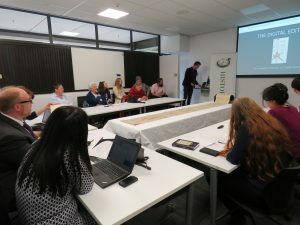 Last Friday, staff and students involved in the Canterbury Roll project, along with a team from Nottingham Trent University here to do a scientific analysis on the Roll, met for a symposium to discuss progress so far and our next steps. Natasha Hodgson of Nottingham Trent University talks about some of the Roll’s features. Chris Thomson discusses the significance of the Digital Edition, and the work the Arts Digital Lab has been doing. 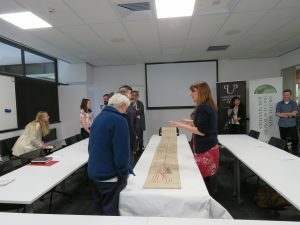 We had some great presentations from the various people involved in the project: everything from the project’s lead transcriber, Maree Shirota, talking about how the Roll fits into the larger picture of medieval genealogies, to Haida Laing of Nottingham Trent talking about how her team use the latest imaging technologies to discover the secrets of ancient documents and artworks. 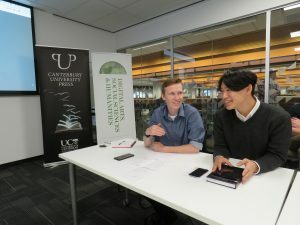 Even our Arts Digital Lab interns, Josh Kim and Jayson Boon, gave a presentation, talking about the work they’re doing marking up in TEI the connections between historical figures on the Roll. 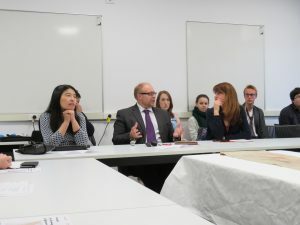 An important part of the symposium was a round-table discussion of the next stages for the project – watch this space! Chris Thomson, with Joanna Szczepanski from the Canterbury Museum, gave a presentation to NDF2017 last week, describing the Macdonald Dictionary Crowdsourcing project, a recent collaboration between the Lab and the Museum. You’re invited to our 4th Digital Humanities monthly meetup: “Online Collections & Exhibitions: An Introduction to Omeka”. Omeka (https://omeka.org/about/) is a free, open-source web publishing platform for the display of collections and exhibitions. It’s used by libraries, museums, archives, scholars and communities around the world – including students and researchers here at UC, with the support of the UC Arts Digital Lab. If you’d like help installing VirtualBox, feel free to drop into the UC Digital Arts Lab (Karl Popper 414) any day between 9-5pm, before Tuesday 30th. 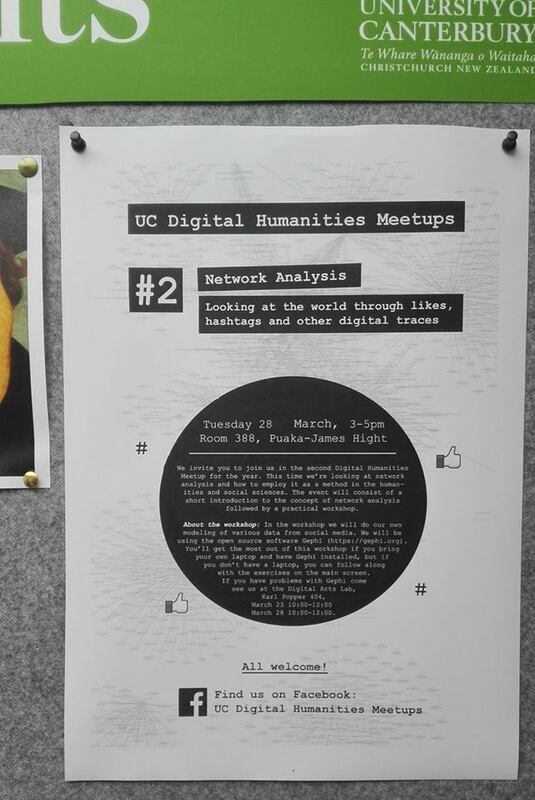 The 3rd Digital Humanities monthly meetup is entitled “Internet Memes: The crumbling boundaries between the serious and the unserious”. The study of Internet memes is new both as concept and practice. This is largely due to the novelty of the concept itself, as well as the academic resistance against the serious study of the unserious. But the boundary between the serious and unserious is crumbling, and cyberculturally literate scholars have emerged to tackle the task of studying memes. This presentation will explore the three major traditions of meme studies in their historical, theoretical and cultural contexts, introducing the most prominent thinkers and how they are shaping the future of meme studies. The presentation will be followed by a workshop in which participants will learn how to start their own memepage on Facebook. A laptop or a smartphone is recommended for the workshop, but not required. As always, feel free to invite others and we look forward to seeing you! 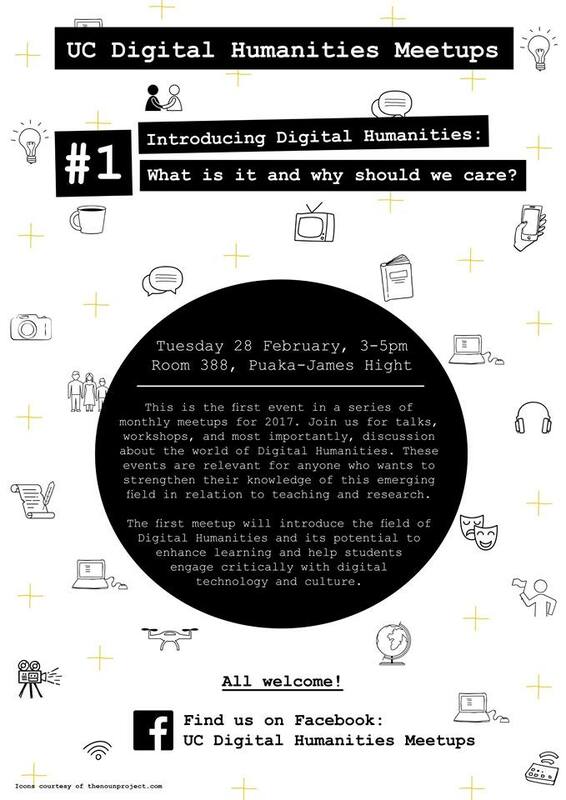 Come along to our first Digital Humanities meetup for the year – “Digital Humanities: What is it and why should we care?” – at 3pm Tuesday 28th Feb, Room 388 Puaka-James Hight (Central Library). All welcome!